Beautiful handcraft wire wrapped natural crystal tree of life pendant necklace with 30″ stainless steel chain. Material:silver plated wire,clear quartz,amethyst,green aventurine,citrine,gold sand stone,lapis lazuli and red agate. Measurements: 45mm(1.77inches) in diameter. If you are looking for something very noticeable, that is it! Lead, nickel, cadmium safe. Beautiful wire wrapped magic balancing stone jewelry. Ready for gift giving!.? Handmade with love and care!. 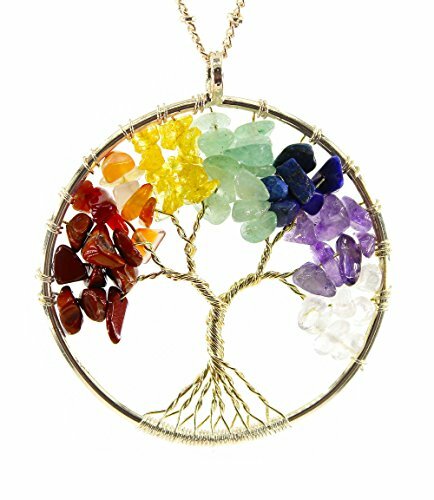 ?Beautiful handcraft wire wrapped natural crystal tree of life pendant necklace with 30″ stainless steel chain. Material:silver plated wire,clear quartz,amethyst,green aventurine,citrine,gold sand stone,lapis lazuli and red agate. Measurements: 45mm(1.77inches) in diameter. If you are looking for something very noticeable, that is it! Beautiful wire wrapped magic balancing stone jewelry. Ready for gift giving!.? Handmade with love and care!. ?